The Golden Circle in Iceland is the most popular day trip in Iceland from the tourist hub of Reykjavik. 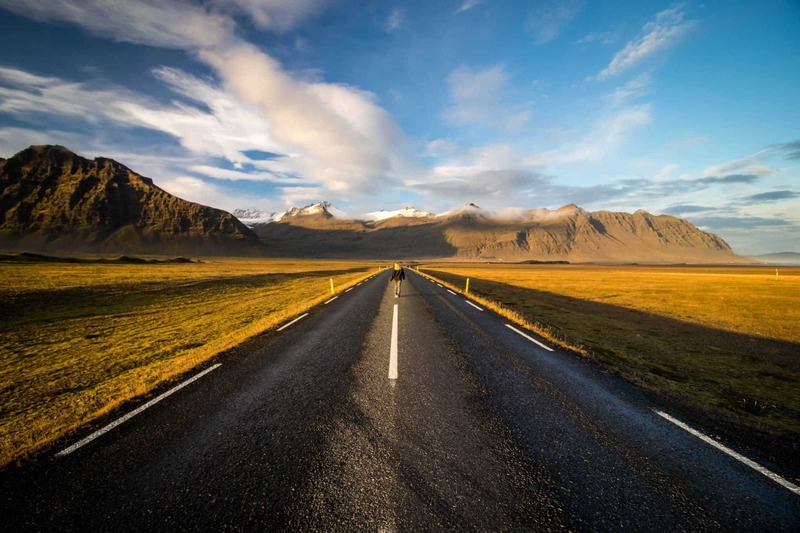 So what is Icel It’s a 230km route that features some of Iceland’s most stunning natural landmarks that are all on a days drive? Most tourists opt for a bus tour, but we suggest picking up a vehicle and driving the Golden Circle yourself! Not everyone can take 10 days in Iceland to drive around the Ring Road. 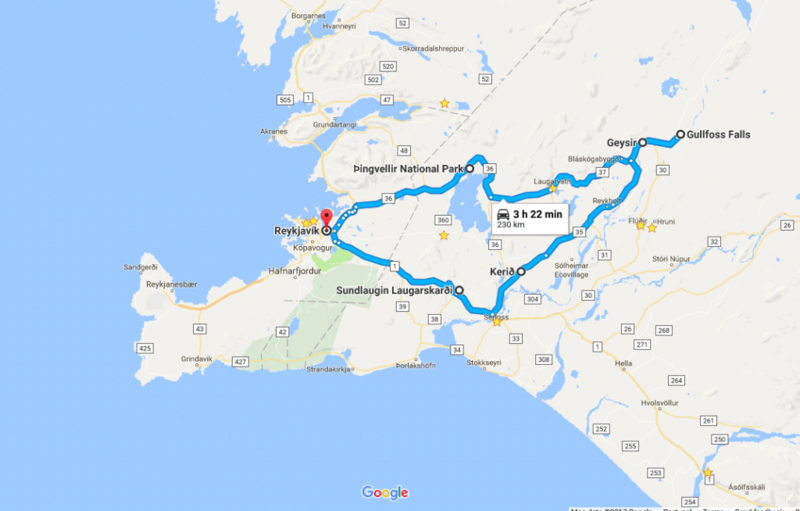 So, taking a small rental car or renting a campervan for a few days for the Golden Circle and Southern Iceland is a great alternative. We’re avid self-drivers having done the North Coast 500, Faroe Islands, Northern Ireland, and Overlanding across Africa because we love the freedom that our own car affords us. Having this freedom means you are not rushed from one car to the next while driving the Golden Circle and have time to enjoy yourselves. 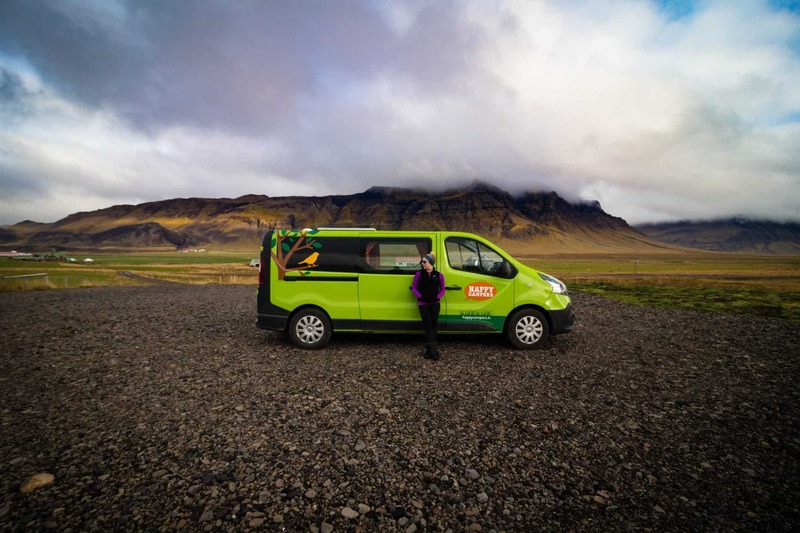 If you plan on driving the Golden Circle in Iceland yourself or even if you plan on taking a tour this guide will be sure to help you out! The first stop on the Golden Circle is Iceland’s first National Park, Þingvellir. Not only is it the first national park, but it’s also the location of Iceland’s first Parliament, started back in 930 AD. Back then an assembly of 48 chieftains would gather to discuss Viking law and hold court. It’s regarded as the founding of Iceland as a nation and historically important to Icelanders. Most notably this is also where the Eurasian and North American plates are slowly splitting apart. The drifting continents have created deep fissures and volcanic activity. One of the fissures is famous as it is filled with shimmering glacier water. For an incredible day out, tourists can put on wetsuits and brave the glacier water for an out of this world diving and snorkeling experience between two continents. 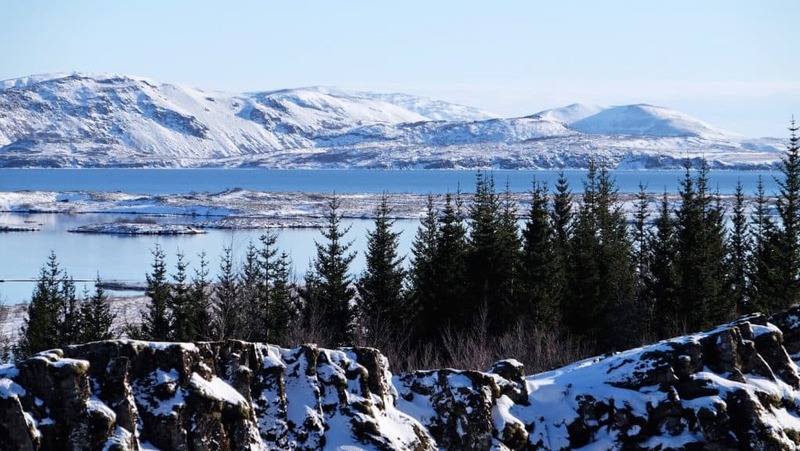 Þingvellir is located 40km NE of Reykjavik and takes about 40 minutes from the city center. The countryside is wonderfully filled with farms, mountains, and valleys. Once, you arrive you will have to pay for parking, however, it’s well worth the small fee. After Þingvellir you head to the Geysir Hot Spring Area, a geothermal area roughly 60km to the East. You can view two famous geysers in the area, Geysir, and Strokkur. After an earthquake, the original Geysir no longer erupts, but it’s neighbor Strokkur erupts at regular intervals. There is an impressive gift shop/cafe that’s perfect for a pit stop. Just be prepared for Icelandic prices as a sandwich and drink will set you back almost $20. We drove the Golden Circle in our camper van so we cooked lunch off the road away from crowds. We recommend packing a picnic lunch either way. This is one of the most spectacular waterfalls in Iceland. It’s a mesmerizing sight to watch the Hvítá River drop down a deep ravine. 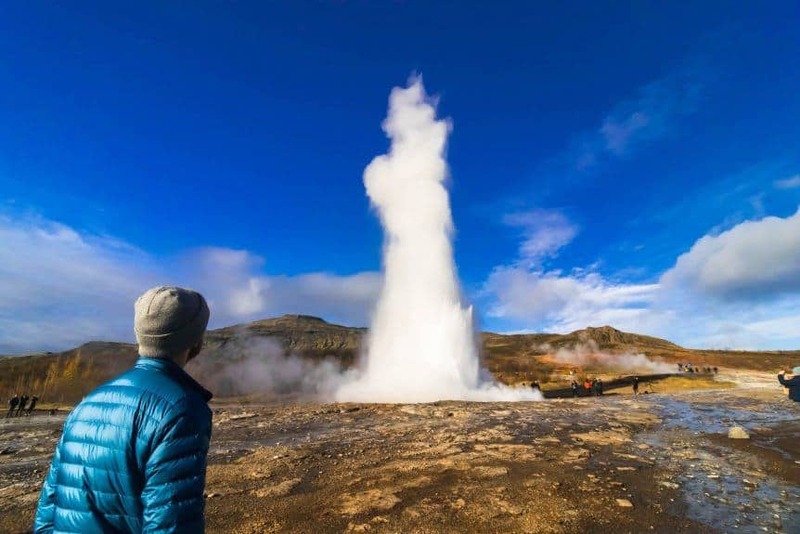 It’s an amazing sight that is one of Iceland’s most popular attractions. Make sure to bring a camera and rain jacket as the waterfalls produce a thick mist and frequent rainbows. The waterfall is accessed from a large parking lot with a pathway and steps that allow for visitors to walk along the edge of the mighty waterfall. To stand at the edge of Gullfoss waterfall is a wet and amazing experience. 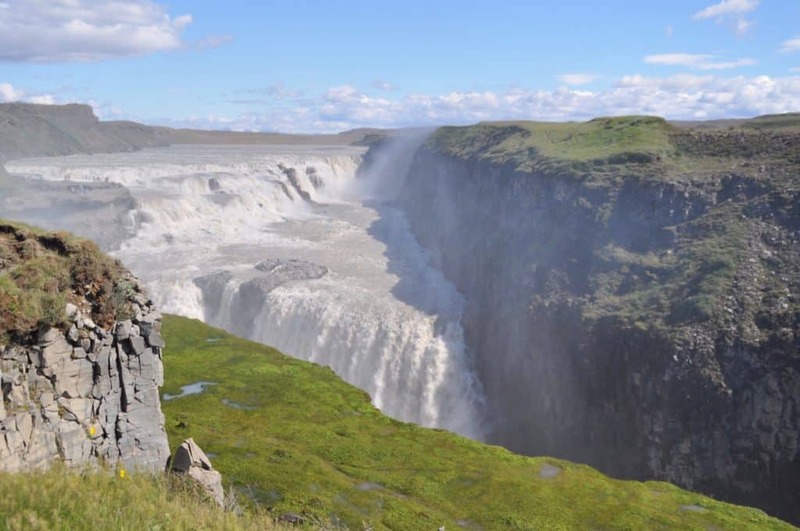 Once you finish up at Gullfoss you need to backtrack a bit to head on to the Golden Circle. 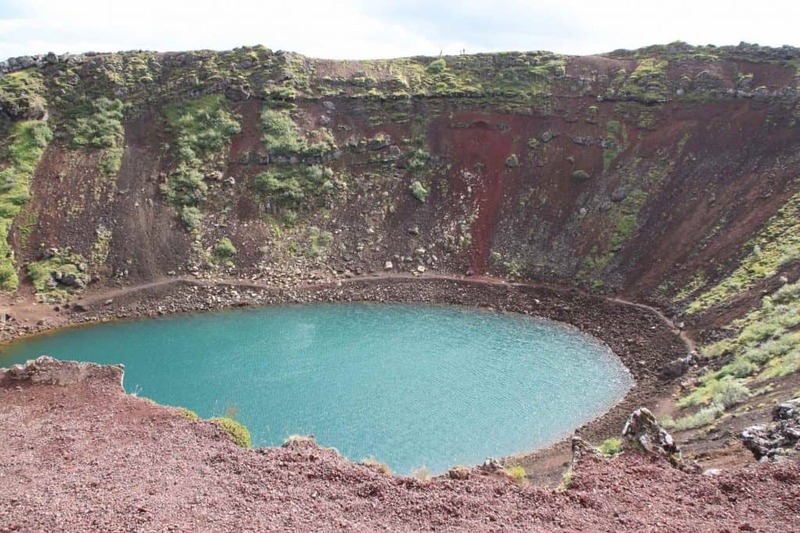 The Kerid Crater is a worthy stop on the Golden Circle that not everyone makes. It’s a former cone Volcano that has since collapsed. It’s also the only stop on the Golden Circle that does charge an entrance fee. However, it’s not much at 400 ISK or $3.50 USD. The bottom of the volcanic crater is a deep sapphire blue that is a sharp contrast to the red rock of the crater. It’s a marvelous sight along the Golden Circle. It’s also quick as it only takes a five-minute climb. Most people pass right through this town on their way back to Reykjavik. However, we suggest making the stop and heading to one of Iceland’s historic pools. Unlike the tourist traps of Secret Lagoon and Laugarvatn Fontana the swimming pool in Hveragerði an authentic Icelandic experience. The pool is one of the first its kind constructed in Iceland. It’s entirely fed by geothermal water and features a 50m Olympic length outdoor pool, along with a diving board, steam room, hot tub, and cold tub. It’s also a place in Iceland where locals and tourists truly intermix. Before you head to a pool in Iceland we recommend you read up on the etiquette here. Icelandic pools typically charge between 600 ISK-900 ISK for a dip. This doesn’t include a towel, so make sure to pack a travel towel that folds up well. Not a driver? Book a Golden Circle tour here! It takes just under three hours to drive the Golden Circle. So, a reasonable amount of time would be about five hours with stops, or you could spend the whole day along the route. We spent the night along the route in our Happy Campers’ camper van. If you’re not on a Golden Circle tour you have a lot of flexibility with time. There is a plethora of detours and Icelandic horses to be pet! During the summer months, it’s easy to do it any time of day. You could even leave 10:00 p.m. chasing the midnight sun. Either way, we suggest going early or late in the day to avoid peak crowds at midday. If you’re visiting Iceland outside of the winter months driving the Golden Circle you’ll have no problems. However, come winter time the roads are icy and caution should be taken. If you’re interested in the weather and about the best time to visit Iceland we have a post. To stay up to date on road conditions check out Vegagerdin run by Iceland’s road authority. When driving the ring road we suggest you download an offline Google Map and save the points of interest along the route. That will make driving between stops painless. It really is easy as there isn’t much traffic once you leave Reykjavik. Be warned car rentals are not cheap in Iceland and gas is just as expensive. When we drove the Golden Circle has was around $2 a liter or $8 a gallon. You do not need a 4×4 vehicle to drive the Golden Circle. Car rental insurance does not cover F-roads. We opted for a tour with Moonwalker to explore Landmannalaugar; however, we still saw many tourists off road in their vehicles. We would not recommend this unless you’re specifically renting from a specialized 4×4 company who is aware of your travel plans.